These are similar to the 3D stars already posted! 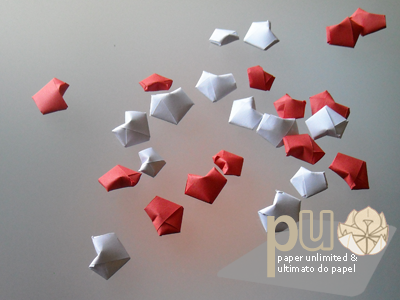 As them, these can reuse various papers: wrapping paper, origami paper, publicity or pretty sheets of paper. I made these in two colours only but can do them in various shades of red or whatever colours you wish! More visual appeal will be achieved with a set of two colours however. For first tries either a 20x420mm /0.78×16.5″ strip of paper (from an A3 sheet) or a 10x297mm /0.40×12″ (from an A4 sheet) strip are good sizes. 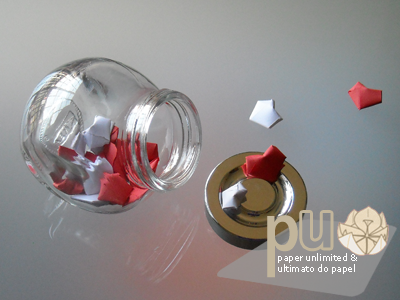 The more the paper weights the larger can the strip become. Best results come with longer strips! Another second version diagram of the waribashi magazine. Download or view the 3D heart diagram! Basically you make a knot with the strip; you crease the resulting pentagon real well; you turn the pentagon into an irregular one. Since the pentagon is no longer regular you have to make slight adjustments as you fold without creasing. As soon as the heart has enough volume you hide the strip tip into the folded heart. Most times there’ll be more paper on the strip than needed. The last step is to inflate a bit the heart. The result is a simple 3D heart. Depending on the length of the strip you might to do more than the steps shown. If that happens you can still use these steps to guide you; if you keep folding you’ll need to repeat some steps, equal or similar to the ones in the diagram. Oh, happy Valentine’s Day! Or happy «Single by Conviction Day» (; let it be your way! This entry was posted on 2011|02|14 at 15:19 and is filed under diagrams, origami. You can follow any responses to this entry through the RSS 2.0 feed. You can leave a response, or trackback from your own site. I can’t open the link. I really want to make these! Try to right click the link and «save» or «save as» and save the pdf on a folder of your choosing in your pc and then open it… Since the pdf is heavy on images it might be difficult to open it on your browser! Oh that worked, it’s just never happened before. Thanks very much for you help.